Samsung unveiled latest smartphone Galaxy J7 NXT in India, with a lot of good efforts and very impressive design. Galaxy J7 NXT smartphone has a mid-range device, that’s mean it will effort everyone. So the users of Galaxy J7 NXT have good news, today we share some important note about rooting tutorials. Use below article and get improve our smartphone with advanced features and good result. In the given article we show you how to root Galaxy J7 NXT using PC. Follow and get towards the next part of this article. Basically, the rooting process is more important for every kind of smartphone. The rooting process has developed by third-party developers, but it has a lot of good result after applying on our device. Such as once we root our device, then we are able to install third-party maximum apps, that’s aren’t support stock ROM. And also we installing Custom ROMs that are developed by the third party with advanced features and some better result. And a lot of other useful good efforts we use after rooting our device. Charge your smartphone up to 60%before starting the process. Fully backup your important data and save to safe location before gaining the process. Enable USB debugging and OEM unlock, for to do go to Settings > About phone > Build number and tap it 7 times to enable Developer options on your device. Then go back to Settings >Developer options and enable USB Debugging and OEM Unlock. Follow the step by step guide correctly, and don’t mess up any step during the process. Others way we will not responsible for any loss and damage, proceed at their own risk. Download the latest version of ODIN from here. Step 1: First, download the TWRP Recovery file, and extract it the zip file. You will get the .tar or .tar.md5 extension. Step 2: And then Turn OFF your Samsung smartphone properly. Step 3: After that, press and hold the Volume Down + Home + Power button at the same time for a while to boot your device into Download Mode. Step 4: Now open ODIN on your computer. Step 5: Connect your smartphone to PC via suitable USB data cable, “Added” message will appear on the ODIN screens once your device connects properly to a computer. Step 7: And then click on the options tab on the ODIN screen and select only Auto Reboot and F.Reset Time. Don’t select any other option in the ODIN window. Step 8: Finally, click on the Start button and proceed the process. Step 9: Once the process complete, then you will see the PASS message on the ODIN screen and your smartphone will be reboot automatically. Step 1: First download SuperSu file from above link. Step 2: Then copy and paste into your device internal storage. Step 3: Boot your device to TWRP Recovery menu, simply press and hold Volume Up + Power button at the same time for a while. Step 4: Now go to install option on TWRP menu and navigate and select SuperSU file. And swipe to confirm the installation process. Step 5: Once the installation process completes then go back to TWRP Main Menu and select Reboot option and Reboot your device. That’s it! 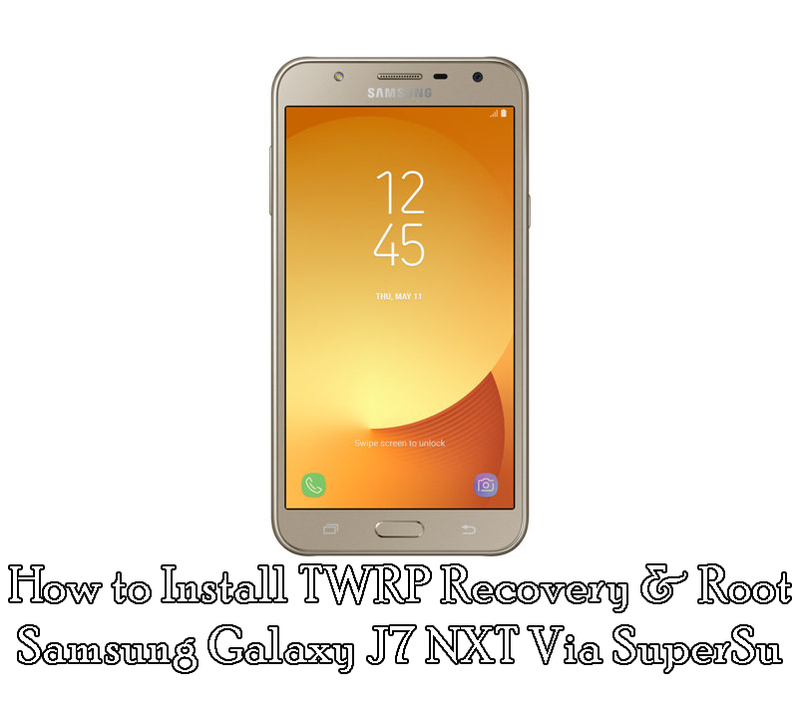 Simply you have install TWRP Recovery and Root Galaxy J7 NXT with easy method. If you have any doubt, then feel free and leave the comment.